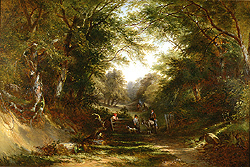 Edward Charles Williams was born on July 10th, 1807 and was the eldest son of Edward Williams (the British landscape painter). 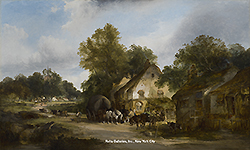 He received his early training from his father, as can readily be seen from the similarity of their works – both painting in the same woodland style reminiscent of the early Dutch landscape artists. 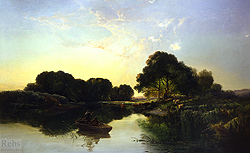 In the early 1840’s he was living at 2, London Street – close to Dante Gabriel Rossetti and William Holman Hunt – and exhibited his first work at the Royal Academy in 1840 – A Gypsy Encampment – Moon Rising. By 1854 he had moved to Hammersmith and in 1857 his first wife, Mary Ann, died. His only child, Alice, was born a year later to a woman who had been his wife’s nurse – the two did not marry for another 10 years. 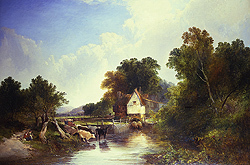 Williams lived in and around London for most of his life and many of his paintings feature scenes from the surrounding countryside including Kent, Surrey Sussex and Essex. He was the least prolific exhibitor of the family, but did exhibit at all the major exhibition halls, including: The Royal Academy, British Institution, Royal Society of British Artists, Institute of Fine Arts and the National Institution. 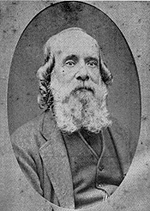 Williams died on July 25, 1881.